1770 was started in 2005 by Alex Binnie and Jason Mosseri. For the first 11 years we were called Into You 2 – we were the “sister” shop to the shop Alex started in Clerkenwell, London in 1993. Into You London was considered the premier custom tattoo shop in town for 23 years and closed in October 2016. With the closure of Into You we thought it would be appropriate (and fun) to change our name, and so 1770 was born. Just a year later, Jason decided that he wanted to take a break from tattooing to concentrate on his amazing chair making work, and so Alex took over the full reins. Life is full of change! 1770 is located over 3 floors in a period “cottage” just on the edge of Brighton’s historic lanes, moments from the sea. 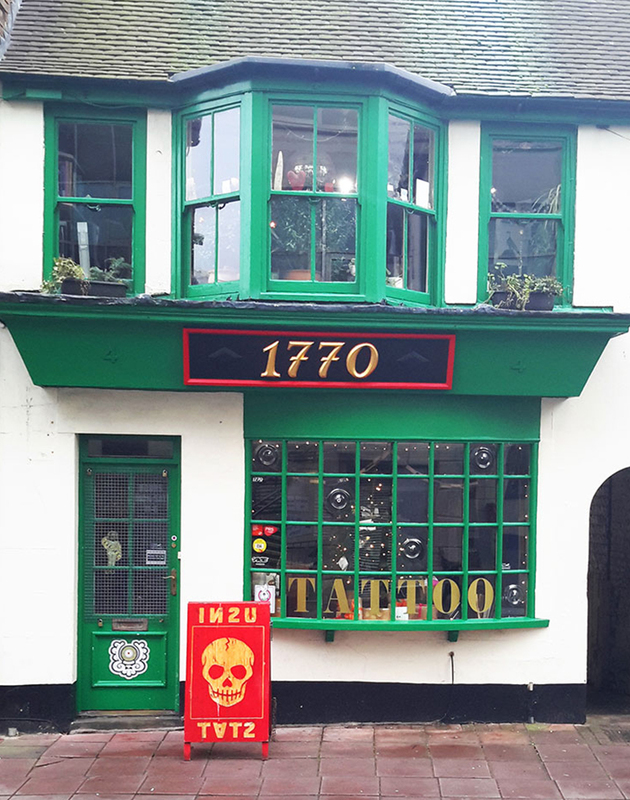 We are one of the longer running tattoo shops in Brighton, and between us we have over 80 years tattooing experience. Our tattoo styles are broad and inclusive, the staff experienced and friendly; our aim is to work with you, the client, and create the best tattoo that we possibly can. We specialize in custom tattooing, and work mainly by appointment, however feel free to swing by and we may be able to fit you in! We have a large range of reference books and designs waiting for you to look through. Teena and I kept in touch and after a while I tired of L.A. and knew that London was ready for its first proper custom tattoo and piercing shop, so Teena looked around and was the one to find 144 St John St. I moved back and Into You proper was born. Initially we only had the ground floor and Teena pierced from behind a screen in the main room, myself in the opposite corner. It was pretty basic, but it worked! After a very short time I asked Curly (who I had known and hung out with in the early Dunstable years) to come and join us, he’d only made half a dozen tattoos from home at this point, but I believed! It was great fun, lots of tattoo names came by – Henk, Horiyoshi, Filip, Freddy, plus British names like Lal (of course) George Bone, Dennis Cockell. We had our share of celebrities too – Britney, Kate Moss, Boy George, Alexander McQueen. More underground names came – members of the Prodigy, Chilli Peppers, Metallica. Not that it’s really about that, but why not name drop a little!